Short Film Program #7 includes a special screening of the first episodes of THE NEW KIND, the new anime-flavored sci fi series from Peter Hyoguchi. We will get an exclusive work-in-progress look at Peter’s extraordinary production, which includes a very successful kickstarter campaign, a remarkable animation crew (over 200 people so far! ), and an innovative, multi-state work flow. The line up also features Kate Rees Davies’ new short film STICKS AND STONES, shot on the F65 in 4K. 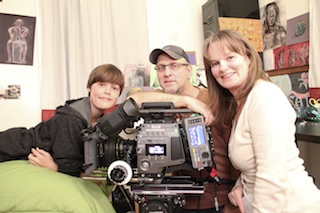 Kate collaborated with DP Steve Romano as she made the move from film to digital shooting. The short film is the story of Sam, an artistic 12 year old played by Cole Ewing, who is being bullied at school. The program includes an encore screening of one of the films from the 2013 LA Film Festival. HOLLYWOOD SHORTS is proud to return as the Presenting Organization of Short Film Program 1 at LAFF this year – and we will screen one of our favorite films from this group, BUSTED ON BRIGHAM LANE by Talibah L. Newman. Talibah wrote and directed the film, which won a 2012 Director’s Guild of America Student Film Award.